The 4th grade spelling words for week 17 is made up of 20 words that include sight words, age pattern, and academic vocabulary. There are 5 activities to help students master the words: Write it Two Times activity, Circle the Correct Spelling activity, Dictation Sentences (where the teacher/parent says the sentence and the student writes it), and two Write a Sentence activities. 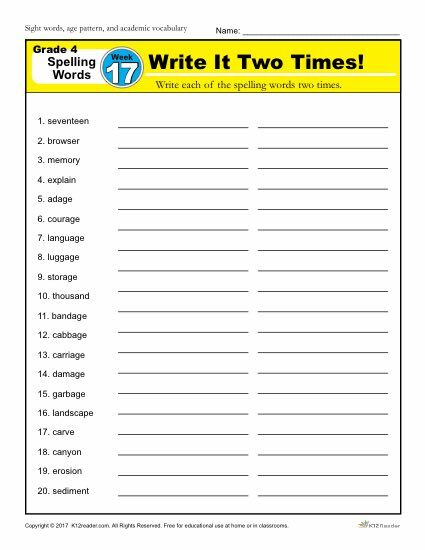 Spelling words include: seventeen, browser, memory, explain, adage, courage, language, luggage, storage, thousand, bandage, cabbage, carriage, damage, garbage, landscape, carve, canyon, erosion, and sediment. This week’s spelling list is part of our free 36 week 4th grade spelling program.